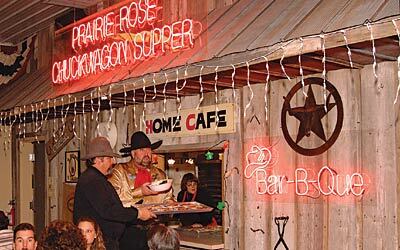 It's fun to experience the Prairie Rose Chuckwagon Supper and Hopalong Cassidy Cowboy Museum in tiny Benton, Kansas, any time of year. But it's extra special around the holidays. As a Christmas gift, friends took my husband and me to the Prairie Rose, run by Thomas and Cheryl Etheredge on a working cattle ranch that's been in Cheryl's family for four generations. 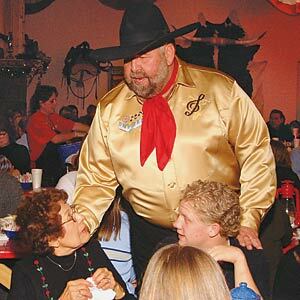 It's the home of the Midwest's biggest barbecue — and the world's largest collection of Hopalong memorabilia. All those Hopalong toys made us feel like kids at Christmas! A horse-drawn wagon took us through brilliant outdoor light displays to the Prairie Rose Opera House. Promptly at 6:30 p.m., the dinner bell rang. We were happy to see meals are served family-style, so we didn't have to wait in a long buffet line. And the food was fantastic: smoked brisket, barbecued sausage, red cowboy beans, potato salad, biscuits and hot peach cobbler. After we polished off seconds, the exceptional Prairie Rose Wranglers took the stage. Interspersed with timeless holiday favorites, the performance was a real treat. With their three-part harmony, classic cowboy songs and wholesome country humor, we understood why this trio played two sold-out concerts in Carnegie Hall! We also loved the Hopalong museum, which honors the beloved 1940s and '50s film, radio and television character, immortalized by actor William Boyd. More than 2,400 products bore the Hopalong Cassidy trademark name, and it was great fun to browse around and reminisce. As a bonus, Hopalong movies run continuously in the Bar 20 Theater. Folks from all 50 states and more than 70 foreign countries have stopped at the Prairie Rose — it's easy to see why.